The holiday season is here and I'm very excited that I've already started my holiday baking. It's my favorite time of the year to share desserts and treats with family and friends. I have the most wonderful memories of my mother being busy in the kitchen, baking delicious pies, cakes, and cookies. My mom would save her change in a jar all year round so that she would be sure to have enough money when Christmas came so that she could buy the ingredients she needed for her baking and candy making. I like to think about her when I'm baking for my children and grandchildren, and they seem to love my baking, just like I loved hers. I've mentioned before how much I enjoy the seasonal M&M's® I always find at Walmart, and sure enough, the other day I found M&M's® Hot Chocolate flavor. So, so good!! And I also bought the Pillsbury™ Funfetti® Holiday Cake Mix and Pillsbury™ Funfetti® Holiday Vanilla Flavored Frosting to make a yummy cake for my family. 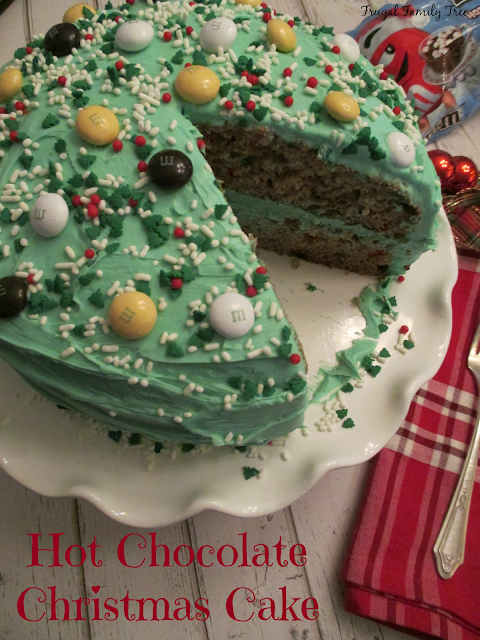 It's so easy to whip up a cake with this cake mix and frosting, and I simply added hot chocolate mix and chopped M&M's® Hot Chocolate candies to the cake batter for a great hot chocolate flavor. I also bought some M&M's® Holiday Peanut because peanut is my absolute favorite kind of M&M's®, though I have to say that all the other flavors are a close second. When my four year old granddaughter saw this cake she said it was beautiful, and that is one of the reasons I bake, for love, for family. I want her to remember her and I baking together, which we frequently do, and remember how much fun we had in the kitchen. And if you love baking as much as I do, how awesome would it be to win a KitchenAid® mixer? Be sure and enter the sweepstakes to be eligible to win one of eight mixers being given away. Simply add chopped candies and hot chocolate mix to the batter to give it that great hot chocolate flavor. I always make sure to use parchment paper and vegetable oil so that my cake doesn't stick to the pan, it works every time. Put together and frost both layers of the cake, then the real fun begins! 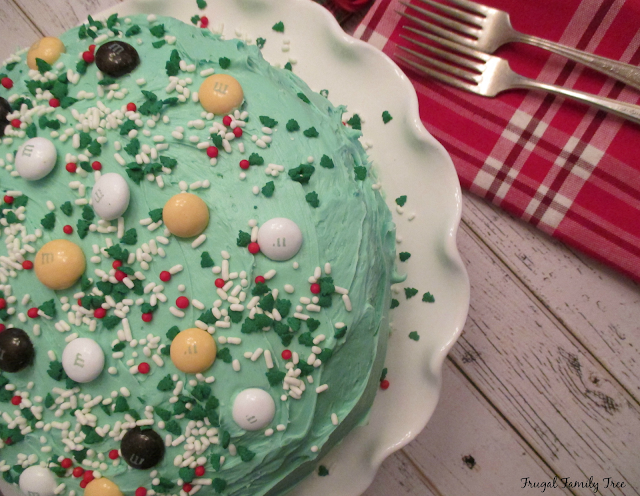 Decorate your cake with the sprinkles that come with the Pillsbury™ Funfetti® Holiday Vanilla Flavored Frosting, and the M&M's® Hot Chocolate flavored candies. 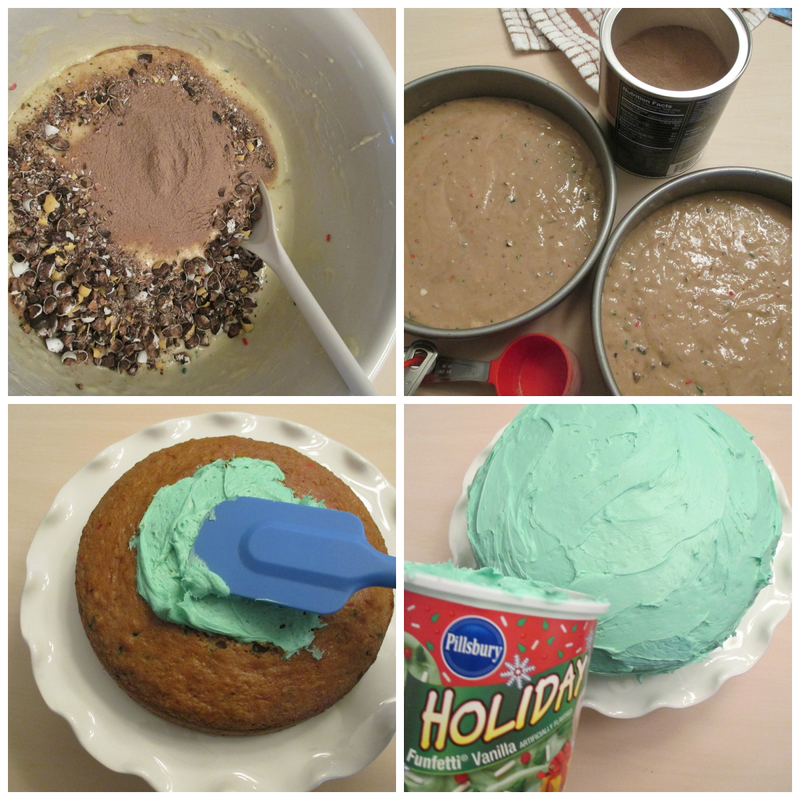 This is really such an easy way to make a fun and festive cake that you can enjoy at home, or bring to a holiday gathering. Preheat oven to 350 degrees. Oil and place parchment papers (if using) into 2 8-inch round cake pans. Combine cake mix, water, oil, and eggs in a large bowl. Beat with a hand mixer at medium speed until well combined, about 2 minutes. Add in chopped candies and hot chocolate mix, stirring well. Divide evenly into the prepared pans. Bake 20-24 minutes until done, and a toothpick inserted in the center comes out clean. Let cool 10 minutes, then remove cakes from pans, put on a wire rack and let cool completely before assembling and frosting. My family and I drink a lot of milk, we can go through quite a few gallons in a week. I always appreciate the low prices on Great Value Milk at Walmart. 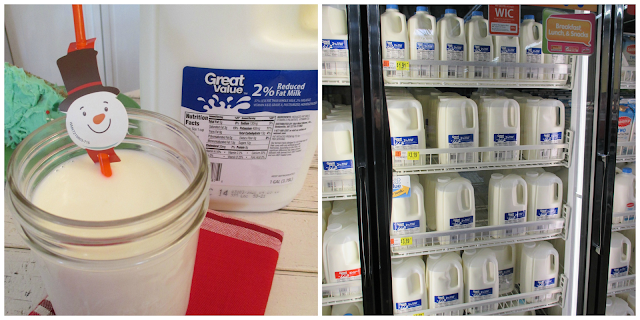 Having a glass of milk with dinner and dessert is something that many people take for granted. But many families with children aren't that lucky, and go without milk and it's essential nutrients because it's not typically donated to food banks, even though it is in high demand. More than 46.5 million Americans – including one in every six children – rely on Feeding America food banks each year. And one of the most requested food items is milk. But sadly, food banks are only able to provide the equivalent of less than one gallon of milk per person per year. But we can help out by making a small donation at pourmilklove.com. The Great American Milk Drive will deliver a gallon of milk – and all of the essential nutrients, including protein, that it provides – to a family in need in YOUR local community. When you purchase two bags of M&M's® at Walmart ( 9.4 oz. bags or larger) up to a gallon of milk will be donated to the drive. What a great way to help get milk to children who need it. And you can also make a donation to the Great American Milk Drive here. 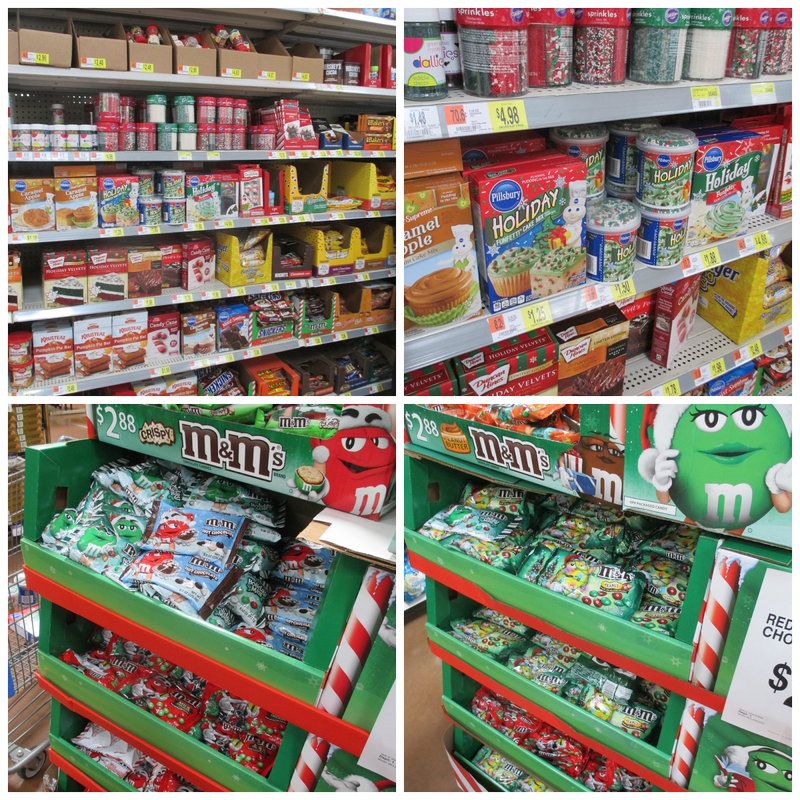 You can find all these products, and additional flavors of M&M's®, at your local Walmart. Check out the baking aisle for all kinds of great dessert and baking ideas. Use this coupon to save $1.00 on any two (2) bags of M&M's® Chocolate Candies 8 oz. or larger. Be sure to check out more delicious holiday baking recipes here. And tell me what your favorite holiday recipe, I'd really love to know.